Retailers often underestimate the difficulty of owning and operating a retail store—especially during the first couple of years. While retail is relatively easy to get into with fewer barriers to entry than most small businesses, the truth is there is a lot more to it than people realize. While it can be very lucrative and rewarding over the long term, it can be a real slog at first. One of the most important considerations is the product or service you are selling. Make sure it is something you believe in strongly because you'll have tough times to muddle through, and your belief in the product or service might be all that is carrying you at times. You'll also need to convince customers that your product or service is worthwhile, and if you don't genuinely believe in it yourself, that is very difficult to do. Before starting, be sure to weigh the pros and cons. You're the boss: For better or for worse, the buck stops with you, the retail owner. You get to set the rules, hire the employees and eventually reap the profits. If you're the sort of person who has her own ideas about how to do things and are confident you can be successful doing it, being in charge is a good fit. Your own vision: It's a great feeling to be able to make a living from a company or concept you believe in. You can create the atmosphere and a company culture that you want to work and shop within. This includes everything from the products or services you are selling to how you're selling them, how you manage your employees, and more. Helping people: You get to help people in a real, tangible way. Whether you are providing goods or services, you can make a difference in the lives of your customers. Even if what you are selling may seem mundane, you'll still meet customers, colleagues, and competitors, and almost certainly will learn more than you ever thought possible. Contribute to your community: You can provide jobs and help others realize their dreams in life as well. You can become a part of the fabric of your local community by supporting broader visions within the civic sector, and you can serve as a mentor to your employees. You're the boss: As much as it's a benefit, being the boss can be a challenge. While the freedom is great, it comes with almost total responsibility. The buck stops with you, so you have to be ready to take the bad along with the good. Financial risk: You'll almost certainly have to make a large cash investment up front, even if you go the franchise route. Plus, be prepared to be the guarantor on all of your retail business' debt, meaning you will be responsible for all the bills even if you close the business. Even after you've started turning a profit, you might not feel like you're always getting the most bang for your buck. This is why it's so important to pick a business or a line of merchandise you're passionate about, so you can weather the tough times. 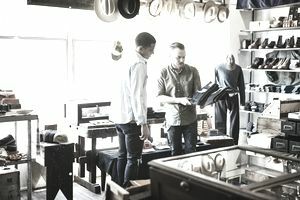 Long hours: If you're allergic to long hours and little or no pay, it's not even worth getting started with a retail business, because that will be what it looks like for at least the first year. Vacations? Maybe if you go to a trade show or convention, but otherwise, time off is out of the question while your business gets going. You'll probably have to wear a lot of hats, from ringing the cash register to cleaning the restrooms. Difficult customers and employees: While meeting new customers usually is a pleasant experience, not all customers are going to love you. It will take some getting used to. Likewise with hiring employees, sometimes you're going to get a dud, and no one likes having to fire someone. But that likely will fall to you at some point.